The crossover SUV segment is growing exponentially, and with that comes more choices. One of the more popular comparisons is the 2015 Toyota RAV4 vs 2015 Honda CR-V because both are similar in capacities and size. Where the RAV4 excels, however, is when it comes to standard and available features, as well as MSRP. When the 2015 Toyota RAV4 is compared with the 2015 Honda CR-V, it is easy to look at the specs and chalk it up to a tie between the two vehicles, but when you really dig deeper and look at the handling, value and reputation, we think you’ll find yourself agreeing with us that the 2015 Toyota RAV4 is the right choice. The 2015 Toyota RAV4 and the 2015 Honda CR-V even look similar, which can make things slightly more confusing when trying to decide on your new vehicle, but trust us, you’re not going to regret getting a RAV4. The 2015 Toyota RAV4 is great for any occasion, whether you’re looking to take a back road adventure or are looking to help friends or family move. The handling of the 2015 Toyota RAV4 makes for a smooth commute, no matter how bumpy the roads are and the spacious cabin allows for everyone to relax and just enjoy the ride. Get the 2015 Toyota RAV4 in Toronto ON at Attrell Toyota! The 2015 Toyota RAV4 is a great vehicle to drive in Brampton ON because no matter where you are or what you do you can have peace of mind that you will be well-protected and well-cared-for. The 2015 Toyota RAV4 comes standard with a 2.5L, 4-cylinder, dual variable valve timing with intelligence engine and the 6-speed automatic transmission provide drivers with excellent fuel efficiency ratings and 172 lb.-ft. of torque. It comes standard with vehicle stability control, front-wheel drive and available all-wheel drive. 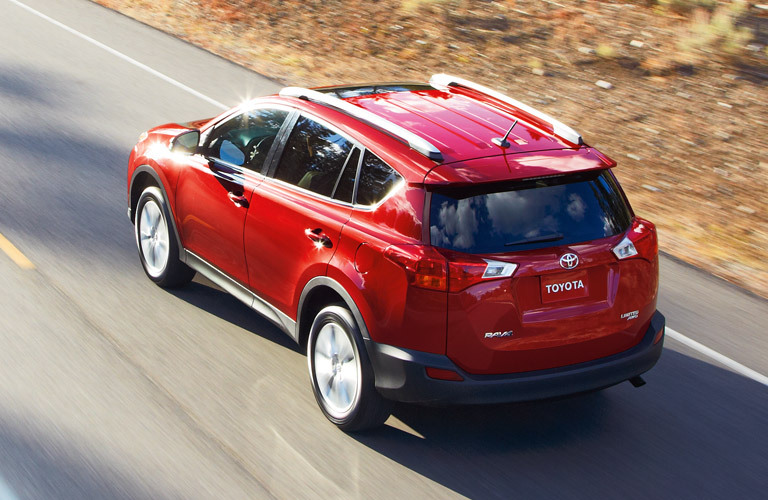 When you drive the 2015 Toyota RAV4 in Toronto ON, you can count on an affordable, smooth, powerful ride. The maximum cargo capacity of 2,080 litres allows for you to spoil yourself a little on the next trip and bring that extra suitcase. As far as safety goes, the 2015 Toyota RAV4 is like none other because it has so many standard features, you won’t believe it. For example, each and every trim level of the 2015 Toyota RAV4 comes with vehicle stability control, traction control, electronic brake-force distribution, brake assist and smart stop technology. Each trim level also comes with multiple airbags, including a driver knee airbag and roll-sensing front and rear head/side curtain airbags. For more information on the 2015 Toyota RAV4, come to Attrell Toyota and we can show you everything you’ve been missing! Give us a call any time to set up an appointment to get more information about the 2015 RAV4.